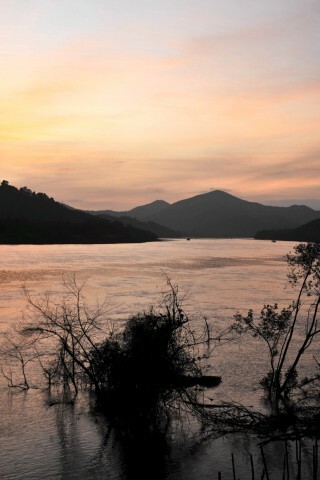 Photo: Pretty scenes around Tanintharyi. The ancient town of Tanintharyi lies on the south bank of the river of the same name and sees virtually no foreign visitors -- so be prepared to greet everyone and star in the selfies of less timid locals. Browse places to stay in Myeik on Agoda.com. Free cancellation. The road south from Myeik follows the river, providing picturesque views before crossing a bridge to where Tanintharyi is found on a hill slope on the far bank. It’s a bustling little spot with a market, tea and curry shops and boat jetties. Above the town are two ancient pagodas, while some of the old city walls can still be made out. The ruins aren’t impressive but some brick remains have been excavated. You’ll find historical information in Dawei’s new cultural museum. The history of Tanintharyi, formerly Tenasserim, goes back nearly 2,000 years. Founded probably by the Dawei people, the outpost was once an important trading and transport centre on the India to China route. It also provided a short cut across the peninsula from the Andaman to Gulf of Siam. Early European travellers headed inland from here on their way to Ayutthaya to avoid the long sea journey around the Malay Peninsula. A large stone pillar just outside the present town represents the founding spot of the 14th century Siamese version of the town. Local legend claims one of the inhabitants was buried alive under the column in order that her spirit serve as town guardian. (Nice!) With the arrival of British control, the centre of activity shifted to the coast and Tanintharyi devolved to the backwater it is today. Rubber, cashews, fruit, fishing and pearl cultivation are the main industries. If you don’t mind a 150 kilometre or so round trip – and road conditions are not bad – you can do the trip out here on your own with a Myeik rental bike. We’d recommend however joining up with an organised tour. Sakura offer this as a day tour by slow boat (not speedboat. They depart from Myeik’s main jetty and wind through the low islands and mangroves of the Tanintharyi estuary and up the hill-lined river to the town. The trip includes a guided tour of the little town and historical sites, lunch in a restaurant and stop offs to check out handicrafts in a riverside village. Rates depend upon numbers. With a minimum of four people it will start at around $80 per person. It’s not cheap but it’s a great day out. You also avoid a long bike ride and have someone knowledgeable explain things to you. Other day tours offered by Myeik operators include a local handicraft and traditional livelihoods tour. These take in a cashew plantation, lobster and crab farms, bird-nest processing, a traditional shipyard and cottage industries such as broom and candle making. The first half of the tour is by road on the mainland and the afternoon sees you catch a local ferry to a nearby island. The guide we met was enthusiastic with a decent level of English. The trip includes transfers from your hotel, lunch in a local restaurant, drinks and snacks plus they’ll finish the tour with sunset at Theindawgyi. This is an enterprising and very interesting tour and with no lengthy boat journeys involved it means more reasonable prices: $60 per person for a group of four or $40 per person for six people and up. Sakura also offer a local industries and mangrove tour on some nearby islands. It’s well worth considering if the weather’s not great for longer ocean trips or you just don’t like long speedboat trips. This one takes in fishing villages and traditional crab and prawn fishing plus fish paste production. It also includes a plastic kayak tour through some mangroves to check out flora and fauna -- particularly bird-life. Price includes hotel transfers, local lunch, snacks and drinks. Starts at $100 per person for a minimum of four. These trips aren’t cheap compared with similar ones in more popular destinations, but they are generally very good. You’ll see plenty of stuff that you’d never find on your own and very few other people will have taken these trips. Jade Flower have a well-placed office next to Golden Mall and Sakura will tout around hotels but you can also help out with numbers, and so prices, by chatting to other visitors you may meet (at a Theindawgyi sunset or by the pool at Eain Taw Phyu Hotel for example). Mergui Sakura Travel and Tours: Kan Phyar Rd; T: (059) 42100, (094) 987 2393; sakuramyeik@gmail.com. See below for more sights and activities in Myeik that are listed on Travelfish.org.